John J. Connors, an attorney for Carlos Ortiz, 27, said after a hearing in Bristol Superior Court that his client “got a ride to North Attleborough to go out with a person who was kind of the hometown hero in Bristol,” referring to the Connecticut city where Ortiz and Hernandez grew up. Ortiz and another man, Ernest Wallace, are charged as accessories after the fact of the June 17 slaying of Odin Lloyd, 27, of Dorchester, whose body was found near Hernandez’s home in North Attleborough. Hernandez, 24, has pleaded not guilty to murder and weapons charges in Lloyd’s death and is being held without bail. Ortiz, Hernandez, and Wallace allegedly picked up Lloyd at his Dorchester home early June 17 and drove him to an industrial park, where he was shot several times in a slaying that prosecutors have described as an execution. Connors spoke Thursday outside the courthouse after a hearing to address a number of motions and scheduling issues in Ortiz’s case. A spokesman for District Attorney C. Samuel Sutter could not be reached for comment. Prosecutor William McCauley told Judge E. Susan Garsh that the government does not object to Connors’s motion asking for a bill of particulars, a legal document laying out the specifics of what Ortiz allegedly did after Lloyd’s killing to help Hernandez. Connors said he expected to receive the document from prosecutors next week. According to previously released court records, Ortiz admitted to law enforcement officials in Connecticut several days after the killing that he was present on the morning of the slaying, but claimed he never left the vehicle and only heard the shots. Surveillance tape from Hernandez’s home shows Ortiz holding a firearm shortly after Lloyd was shot, prosecutors say. In addition, a white towel was found near Lloyd’s body, and Ortiz allegedly conceded that surveillance footage captured him with a white towel around his neck before the slaying. Connors said Thursday that Ortiz had no legal representation when he spoke with investigators, and it is a “good bet” that he will challenge the admissibility of statements from that interview. Garsh scheduled a phone conference call with Connors and McCauley for Feb. 27, when they will discuss the status of the case. Ortiz, who is being held on $500,000 bail, wore a beige shirt and tie and showed no outward signs of emotion. Lloyd’s family members, including his mother, Ursula Ward, attended the hearing and had no comment. 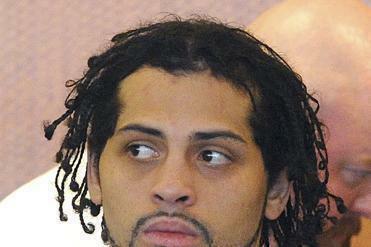 Hernandez is also being investigated for a possible role in a July 2012 double murder in Boston’s South End. He has not been charged in that case.